Sara received notice that she can attend a training camp for a service dog through Canine Assistants next year. They are having her adopt one of their dogs. These dogs are trained to assist a person with a seizure disorder. The dogs can give a person a phone. The dog can lay with the person until the seizure is over. The dog can open a drawer where the owner keeps medications. Dogs have been trained to alert other family members after their owner had a seizure. Dogs can open the refrigerator and bring someone a bottle of water. Sara has been on a waiting list for this dog for four years. I have an incident that comes to mind where a dog could have helped us greatly. If McDonald’s had seen that Sara had special needs we could have avoided a three ring circus. Sara was out with her day program and they stopped at a local fast food chain. Sara told the staff she was having a seizure. The staff responded by applying her bracelet which contains a magnet. This will let off an impulse and help stop or slow down her seizure. The VNS is implanted under the pectoral muscle. The manager called the police. The police then called an ambulance. The ambulance made arrangements to transport Sara to a hospital. Sara who is a well-trained self- advocate recovered quickly from her short seizure said she did not have to go to the hospital. The program director arrived at the locations and was able to “negotiate” the release of our daughter. Our doctor has worked closely with us and has approved the following plan for Sara. If she has a typical short partial complex seizure she should go home, rest, and take extra medication. Every family should have a doctor approved plan for their particular type of seizures and our plan might not be good for another patient. I think if Sara had been accompanied by her service dog the McDonald’s would have seen that this is a young person with special needs. They may have realized the people with her were performing a medical treatment. As a parent I am sure that I need to send Sara out in the community if she is going to experience adulthood. It is often hard to be brave enough to let her out the door. Sending Sara out in the community with her dog will help me give Sara the freedom she deserves, increase her safety, and expand her horizons. For me the dog can’t arrive soon enough. As we say goodbye to another soccer season at Beautiful People, I can’t help but think that another opportunity to bond with Luke is gone as well. There are only so many opportunities I have where it’s daddy and Luke time, this was one of them. My feelings were a little hurt this year since Luke asked for his mother to be his buddy more than me, but if seeing him enjoy an activity requires me to sit on the sideline sometimes, that is ok by me. This soccer season was particularly special for us because we built on relationships we made during the baseball season. It’s not easy talking to people who are not in the same boat as you and while all our children are different, we are pretty much sailing in the same ocean. I’ve said it before and can’t say it enough, but we are very grateful for Beautiful People. On a side note, Beautiful People had their Out of the Park Dinner/Dance this past weekend. The event was held at the Falkirk Estate and Country Club in Central Valley, NY. The fundraiser was a success and a great way to get the Beautiful People name out there. The past couple of events that I attended there had a minimal attendance by the kids of the league, but this year we were so lucky to have a nice turnout by some of the older kids. Watching these kids enjoy themselves in a social setting like this was so awesome and an image that will stay with me for a while. Makes you view your life in a different light. I feel like Alice, about to willingly jump down the rabbit hole and go back to the strange and sometimes scary Wonderland (as in “I wonder when I’m ever going to sleep again” world of having a newborn). My husband and I have decided to try for Baby #3 and it raises a lot of questions and emotions. I have figured out long ago that I can’t be one of those people who stumble into parenthood. I am that type of woman to have a plotted course complete with a GPS. Entering into parenthood again after my youngest is out of diapers is in all respects kinda crazy. The first time you go down the rabbit hole you really don’t know what you’re getting into till the crazy creatures (a.k.a you and your sleep deprived spouse) come out to play. The second trip is decidedly less scary since you’ve given yourself over to the crazy chaos of parenthood. The third trip and beyond, well I don’t know what it has in store for me. I’m certainly taking others along for the journey so I worry how my kids will react and adjust. So far, most people have warned me against revisiting Wonderland. It’s too crazy, and too expensive they say. But here I sit, staring down the rabbit hole and it’s hard to imagine jumping in, but at the same time to never see Wonderland again seems even more frightening. Something changes in you after entering parenthood. It becomes who you are and the chaos just feels like home. I say, God bless the people who trip and fall. It seems a lot scarier to stare into the abyss and work up the nerve to jump when you can’t see the bottom of the hole. There are those who revere order, neatness, money and security, but I suppose I’m not one of them. I don’t think any parent is or else you wouldn’t be able to adjust to Wonderland. The regular rules of the world don’t apply there. Things you clean do NOT stay clean, money disappears almost magically from your bank account, “yes” means “I wonder if that’s the right thing to do” and “no” means “for the Love of God stop asking me already.” So I’m counting down and holding my breath and I pray that I can still find my way around Wonderland. My logical brain is at war with my heart, but then I remember that logic simply has no place in Wonderland…just ask the Queen of Hearts; she always gets her way. My girls are crazy for trains. They build with their Thomas train tracks for hours. I was surprised Madison was such a fan of trains beginning around the age of two and even more surprised that Sophie is continuing the tradition. And, while running the trains down the track, Sophie sings, “tug-a-tug-a-too-too.” I assure you it is the cutest thing ever. 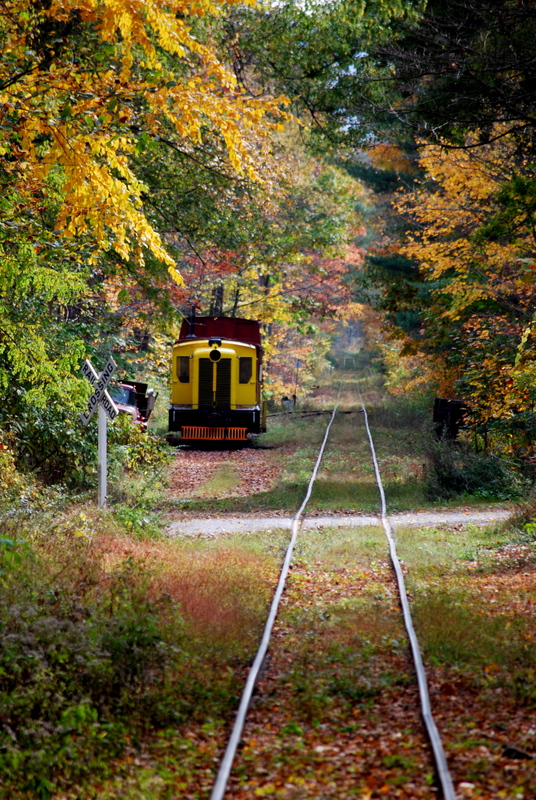 So, I knew the Fall Foliage Train Ride would be a crowd pleaser. 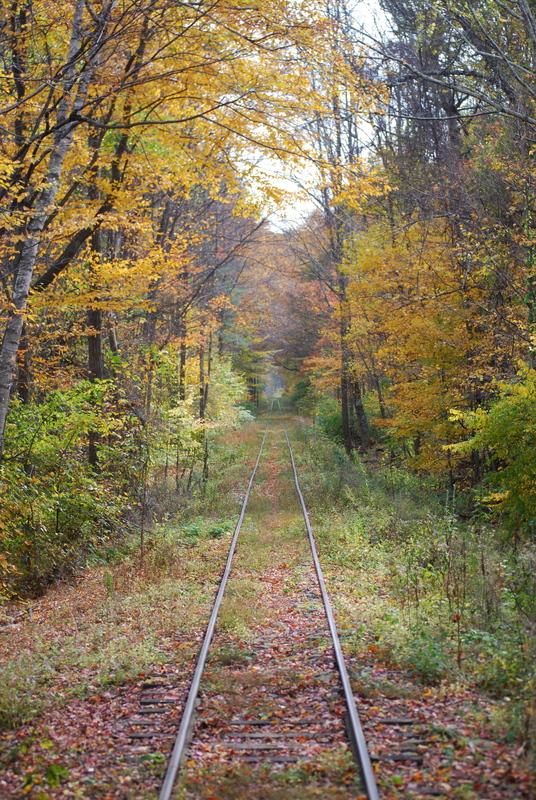 The train is located in Phoenicia, along the Esopus. It is cash only and the cost is $12 per person, $7 for children, and children under four are free with a paid adult ticket. The ride is about 5o minutes total. 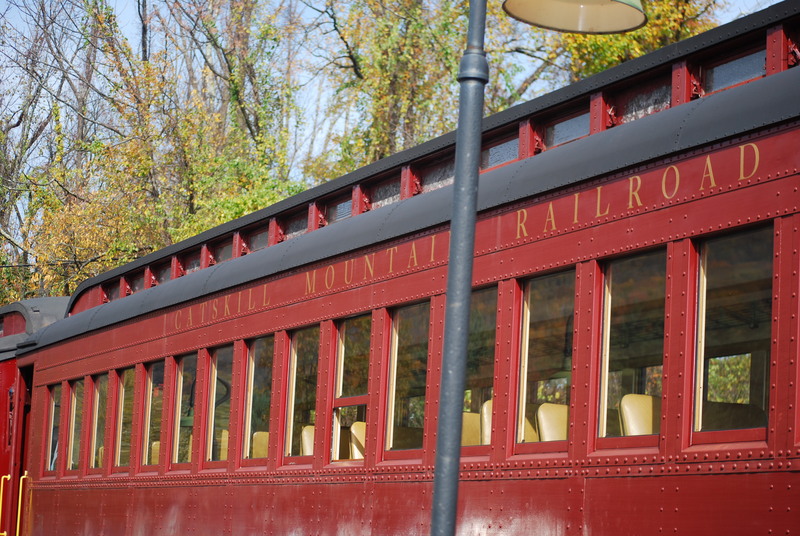 The tracks follow the Esopus Creek and used to run in a circle but due to Hurricane Irene some of the tracks are still undergoing repairs so the ride is currently back and forth. The train has one open air car and two regular cars. We opted for the caboose which we practically had to ourselves. After our trip, we headed up to the front of the train for some pictures. 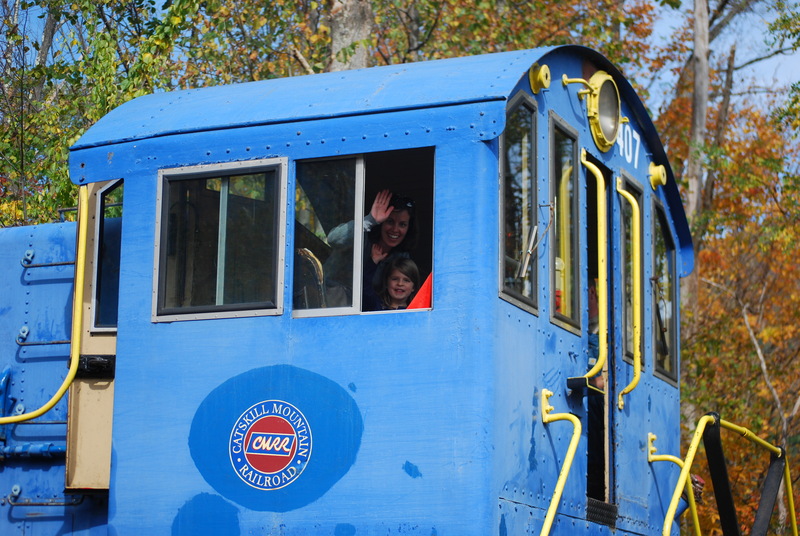 Although not part of the ride, the conductor invited Madison into the cab and showed her around. She was truly in awe. On our way home, we stopped at Bread Alone for lunch. It’s a little cafe with indoor and outdoor seating. They serve breakfast all day in addition to soups, sandwiches, and salads. It was a perfect spot to eat with the kids: the service was quick, and the food was good although not your average burger and fries place. More like Kale Salad and Ham & Brie Cheese, but if that’s not your thing, no worries. They have a varied selection, and their Veggies Alone sandwich even won Hudson Valley Magazine’s best gourmet sandwich. We originally planned this trip for the girls, but it turned out to be a great experience for all of us. The girls were fascinated by the train ride and the Esopus Creek view. 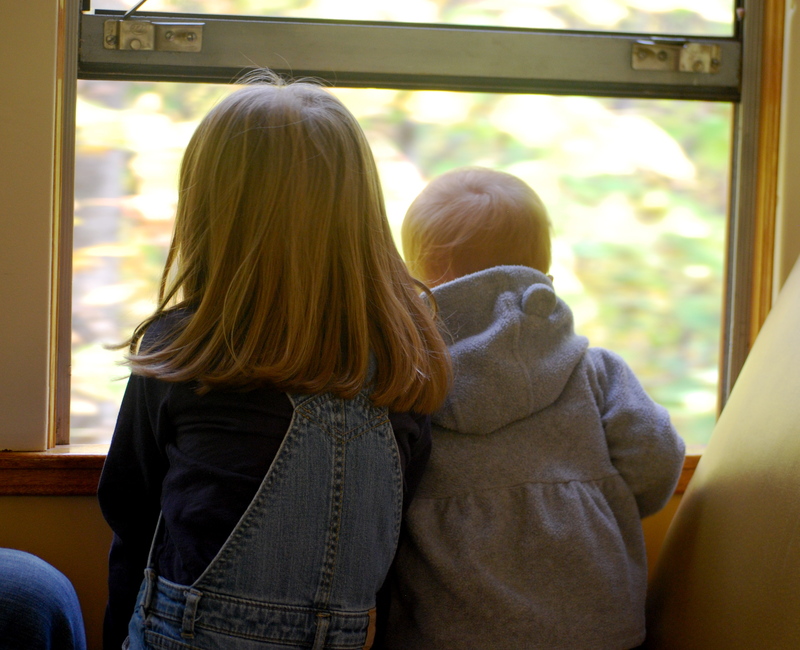 Madison was glued to the window the entire trip, and Sophie became so excited every time the train whistle blew. Because the girls were so enraptured by it all, Mike and I were able to sit back and also enjoy the ride. It was relaxing, the scenery was perfection, and it was a very pleasant way to spend a day. This is their last weekend of the year until May so make the trip today! I don’t know about your Fall season, but mine is insane. 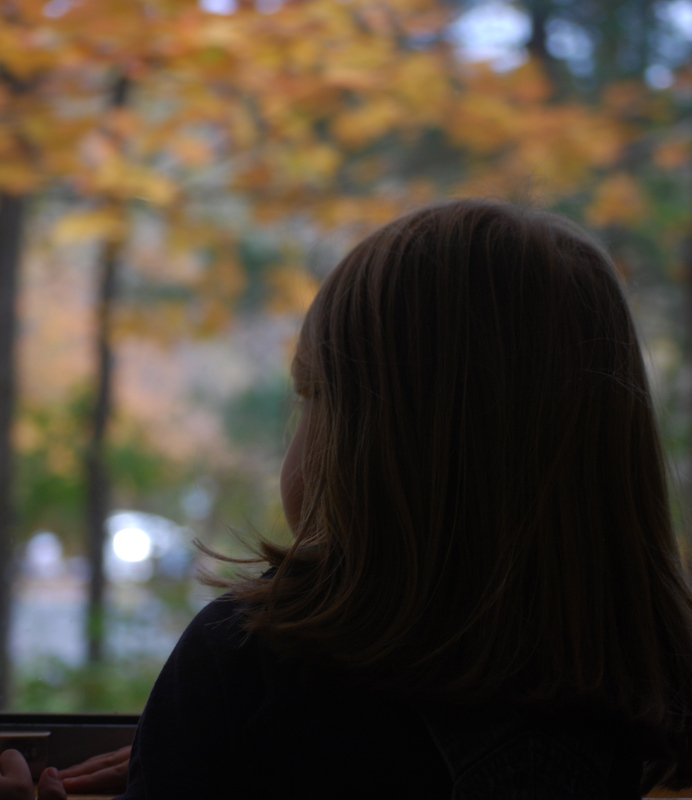 In between sports practices, dance classes, girl scouts, art class, piano lessons, and a morning of homeschooling, my free time is… wait, am I supposed to get free time? I’d better review my contract (ha ha). Being gluten-free means we need to cook more often than not, as who can afford to regularly get gluten-free pizza for a family of four when the individually-sized pies are $9 each? I find we’re out most afternoons well into dinner time, so this time of year is when my crockpot once again becomes my best friend. I forgot to plan ahead for tonight’s dinner (who can guess why?) but knew we wouldn’t be home until six. I already knew we’d burst in hungry from our afternoon field trip, playing on the playground, and dance class, but I haven’t been grocery shopping recently (who can guess why?) so we were down to bare bones. On days like these, I grab my trusty Make it Fast, Cook it Slow, as these recipes are typically made from pantry staples and frozen meats. Bingo!! Flipping through, I found chicken teriyaki. Needing no more than chicken breasts, brown sugar, soy sauce (we use a gluten-free, soy-free version called coconut aminos), brown sugar, sherry (I substituted white wine), and garlic cloves, I was off and running. Putting it into the crockpot took only minutes, and eight hours later, it was waiting for us when as we got home from our day. I served it over rice with broccoli on the side, and everyone was happy. One tip- the sauce is pretty salty- use low-salt soy sauce if you can. I don’t have a picture for you, but lucky for us, the entire cookbook is available on the author’s website, including pictures, so pop on over there. Also, if your husband decides to cancel his afternoon meeting and come home early like mine did, thereby making time for grocery shopping while you run your little one to dance class, count yourself extra lucky. Love you, babe. To find out what’s new in our kitchen, stop by, or become a fan on Facebook. Happy crockpotting! I have been fortunate to attend many seminars on transition, trusts and guardianship. I can safely say for my daughter, Sara, I had every box checked on the New York State Department of Education guidelines for transition. I had a great attorney who was very warm and had interviewed our family, met Sara several times, and had reviewed issues that were important to us. I applied to the Surrogate Court for a date to grant guardianship. All the documents were completed for a health care proxy, a will, a trust, limited power of attorney & advance directives—all completed before that date. I wrote a “Letter of Intent” which is a document describing your wishes to your family about what is important to you and what you would like your child’s life to look like. I added stand by guardians and new members to the trust. I should have been happy with what a great job I had completed; instead I was very surprised how sad I was. The idea of not being there to hug Sara at the end of the day weighed heavy on my soul. I worried about who would watch out for her health needs as carefully as I would. Luckily for me, I have watched Sara’s sister Melissa grow up to be a strong, hardworking, talented, loving and devoted sister. Melissa and her husband are the right people to keep up my work. I am sure they will do a great job. Please explore these legal supports, but be careful, the emotional component for me wound up to be surprisingly more difficult than the forms. I’m going to refrain from naming people and organizations with hopes to not hinder my point. This year I made a decision to trade in my Sunday afternoon NFL football viewing for U9 Travel Soccer. 99.9999% of the time I am much happier watching my kids play than watching the pro’s, but this past Sunday I witnessed such embarrassing behavior from the opposing team that I would’ve rather been anywhere than that soccer field. If you have not been a part of “organized” youth sports, you might not get what I am feeling, but if you have been, you know exactly where I am coming from. Am I qualified to take care of these children for 4 hours a week? (Practice time, plus game day). Ask yourself how you would want to be coached. Would you respond to being screamed at for 60 minutes on a Sunday afternoon? Try videotaping yourself. Most likely, you are unaware of what you sound like. Why are we here? Is it for the kids or for you? Do you realize that in the U.S only in Baseball are your child’s chances of going pro greater than 2%? Odds are your kid being the next Lebron or Messi is highly unlikely. LEARN THE GAME! This coach I watched was yelling at a kid to get in a position that was not even legal. He wanted the boy lined up offsides and approximately 200 ft. away from the throw in. It would’ve taken his team about 10 minutes for that ball to reach him in that position. He also instructed his players to “get in front of the other player, push him down if you have to”. Again, that is not legal genius. I love watching my kids play sports more than anything. The time on a team can be so valuable and so crucial to their upbringing. The association between coaching basketball and Organizational Leadership helped me get through school. It’s not about you. It’s about the children. Back to my title…everyone should visit a Beautiful People event and see what joy and playing sports is about. There’s no yelling. There’s no swearing. Just pure fun. You might learn a thing or two about reality. Trust me… you will be a better person for it. Change Your Wallet By Changing Your Vision! Being frugal means that you don’t take the luxury of worrying about what other people will think about you. It means driving a beater car without any payments instead of that fantastic new model for $400 a month. It all starts with a change of perspective, not a change of income. Income comes and goes just as quickly. I’m working hard every day not to become a slave to my wants. Sure, I’ll always want something. It’s human nature. But, I can make a choice to want what I’ve already chosen. After all, the things we want so much that we’d do anything to have often lose their value almost immediately. You only need to observe your children with their Christmas toys around the end of January to get this point. There’s no magic bullet for getting out of debt and living with your means. It starts with the way you view yourself and your life. I’m ok with people thinking I’m poor because the truth is- our bills are paid, we’re getting out of debt, and I never fear picking up the phone because of bill collectors (as was a common occurrence in my house growing up). What’s the best financial advice you ever received? One beautiful late summer day we were looking for something to do that would let us all enjoy the outdoors and each other. 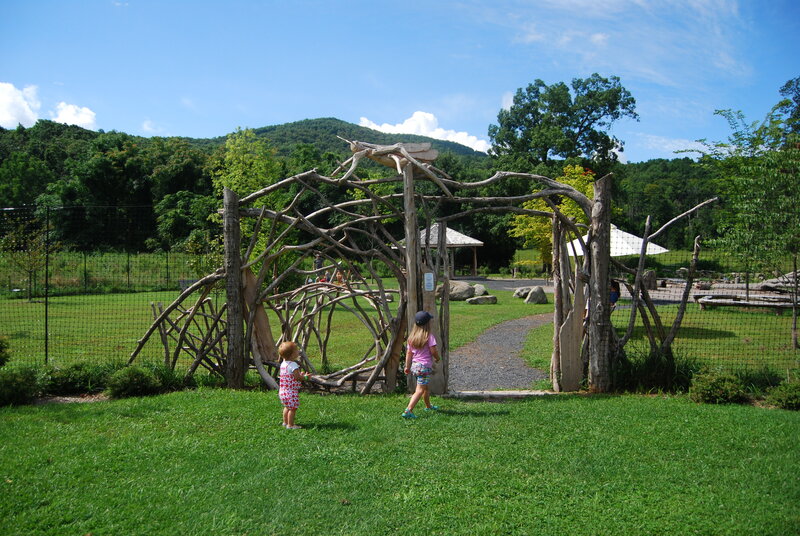 We found what we were looking for when we stumbled upon Grasshopper Grove, a naturalist playground at the Hudson Highland Museum’s Discovery Center. 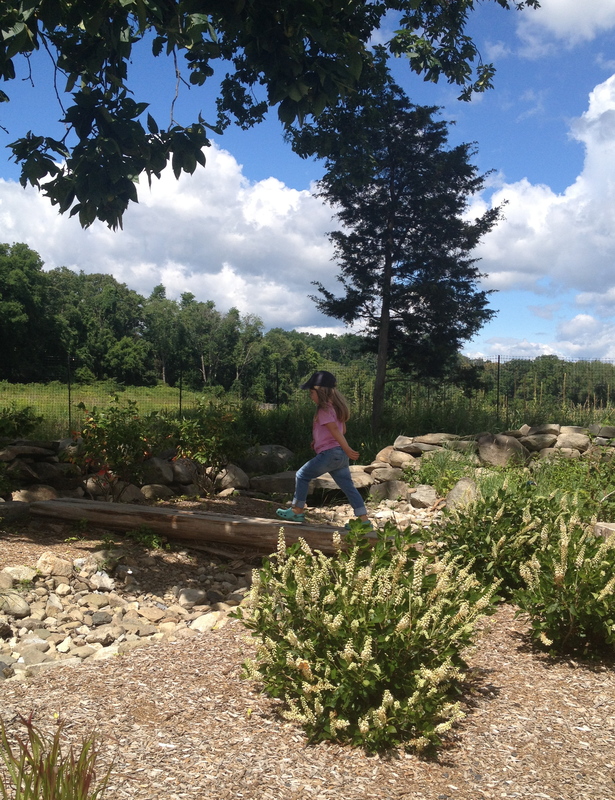 A fallen tree became a balance beam for the girls and a deck on top of a hill became a pirate lookout. Madison built a fire pit out of the loose parts pile and a dam in the trough. Sophie traversed over the bridges and would take the occasional break to splash in the water. There was an endless amount of exploration and imagination to be had, and the park itself was a beautifully landscaped, enclosed area so Mike and I were able to relax on a bench for awhile and take it all in. 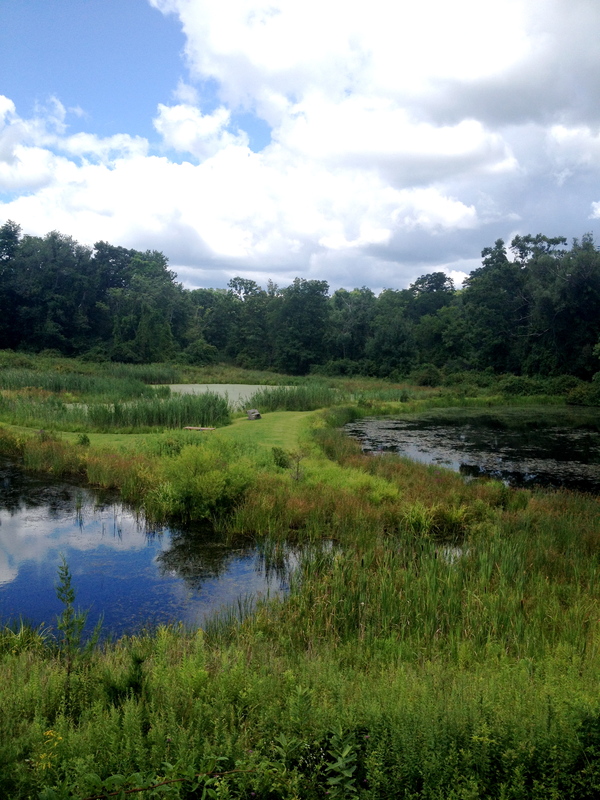 After playing for quite some time, we had a snack on the grassy slope and took a short hike through the fields to look for frogs in Goose Pond. We scoped out the trail map and picked a few different routes to try next time. It was a great morning outdoors, and we walked away with a few ideas on how to incorporate some natural “toys” into our backyard. Grasshopper Grove is open on the weekends from 9-4. It costs $3 per person over 2 years of age. If you are a member of the Goshen Library, pick up the membership pass, and your visit will be free. Upon arrival, check in at the visitor’s center. There are restrooms located inside if needed. 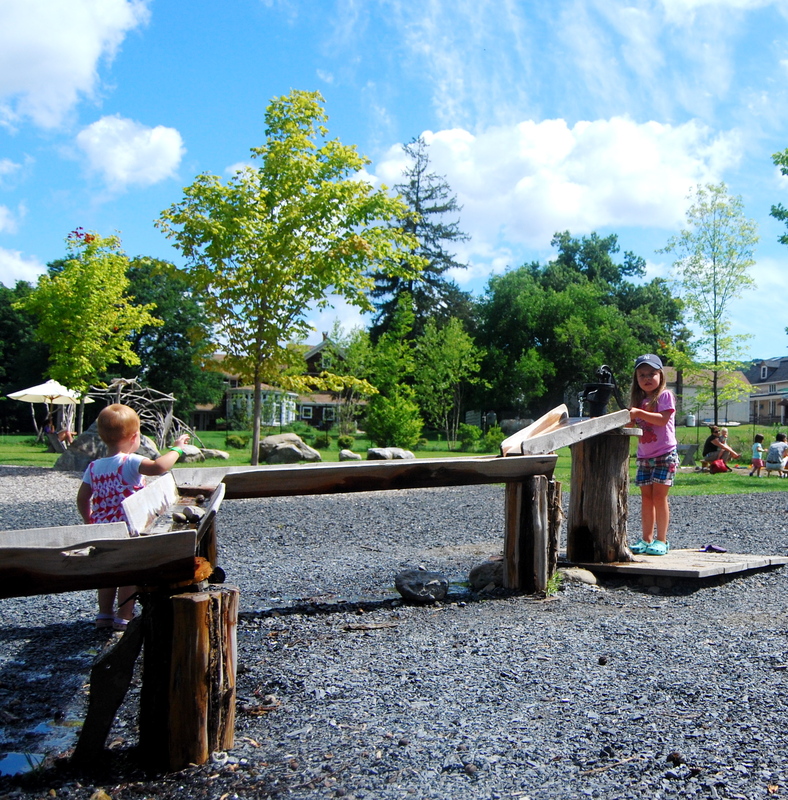 Weekends can be a busy time for families, but if the weather is nice and you don’t have somewhere to be, head over to the Discovery Center and enjoy getting dirty with your kids! By the time Sara entered High School, I was pretty aware of her academic strengths and weaknesses. That being said, our family knew she would be incapable of entering the higher education system based solely upon her academic skill. Instead, I focused on getting her out in the community as much as possible as a means to prepare her for the workplace. Sara is very aware that her academic skills are not equivalent to those of a college student’s. She always would say, “no” she didn’t want to go to college and that it wasn’t for her. Luckily we were very wrong about that. We had the idea that college wasn’t for someone with a developmental disability. In the summer of 2013 Successful Learning Center started offering classes at Orange County Community College in Newburgh, NY. I assured Sara that the class would be at her level and designed for students with special needs. When I told Sara that friends from her day program were going to attend, she felt a level of safety because she understood the abilities of the other students. The new campus at OCCC is overlooking the Hudson River with spectacular views, there is a cute coffee shop right outside of the classroom, and many students are milling about. Inside room 207, the Successful Learner Center (SLC) students are taking the class “Introduction to College Life”. There are thirteen students exploring a new topic every week. The first class asked the students, “What did they want to study in college?” The discussion of week two: “What is the difference between a friend and an acquaintance?” They have homework most weeks. As soon as Sara gets home she completes her homework. One part of the program that adds to its success is there are students from the Occupational Therapy program volunteering in the classroom as teaching assistants. This allows all the students to get a more inclusive educational setting. Sara’s respite worker picks her up after class. No “Mommy transportation” helps Sara feel like other college students that attend there. -do not need to be changed, remediated or repaired. -can effectively identify what they want to learn and what they want from life. -will experience expanded social interaction, increased self-confidence, communicate more effectively and become integrated with the wider community through learning opportunities based on a college campus. Classes are also running in Westchester and Rockland County. Students have a choice of innovative courses that range each semester from computer skills, money management, music, to a class in nutrition. Check out their website http://www.access2college.com to find out more.